This week Lion Bill Guest and Lion Sarah O’Donoghue launched the 2012 Alton Lions EGGSTRAVAGANZA in aid of Bushy Leaze Children and Family Centre. 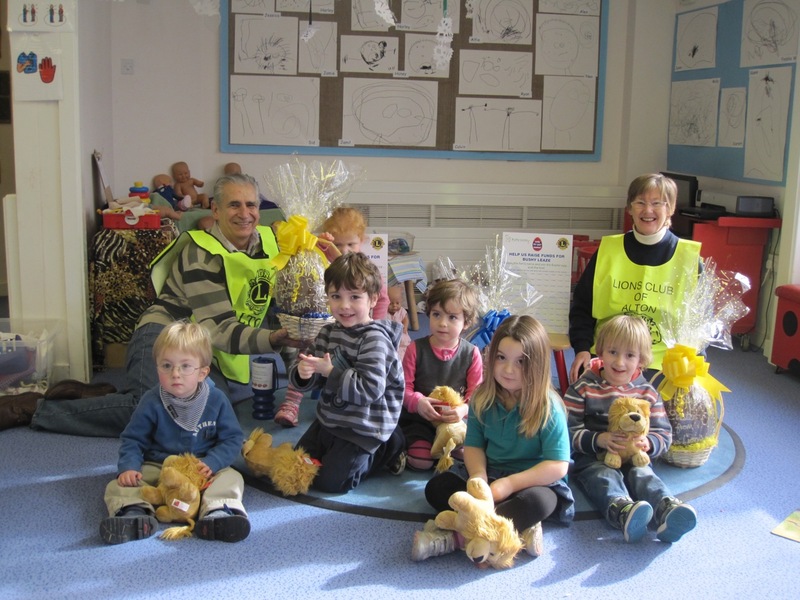 This fund raising project provides eggstra large chocolate Easter Eggs to outlets in Alton and local villages together with an un-named soft toy Lion. Players’ eggschange one pound to choose a name for the Lion and the winner collects an eggstremely tasty chocolate egg and an eggsqisite cuddly toy. An eggsuberant project coordinator, Lion Bill, said that the project has attracted eggsellent support from local pubs, clubs and businesses and he is looking forward to an eggceptionally good result. Bushy Leaze Principal, Patti Snook, said that the Lions fund raising effort would be a great help in enabling the Centre to obtain digital equipment aimed at stretching the children’s learning experience. Bushy Leaze originated as a school for long stay children at Lord Mayor Treloar Hospital and transferred to its current location in Eastbrooke Road in 1996. It is one of just three special needs schools in Hampshire providing specialist education and care requirements for 3-5 year old children from Alton and East Hampshire.